NWHikers.net - View topic - Switzerland picture identification? Forum Index > Trail Talk > Switzerland picture identification? I've been very impressed with people on NWHikers being able to identify some old pictures I have. This one is going to be really tough because it's not the Cascades or Olympics or even North America. All I know about this picture is it is in Switzerland. Anyone spent much time in the Swiss Alps and recognize this? 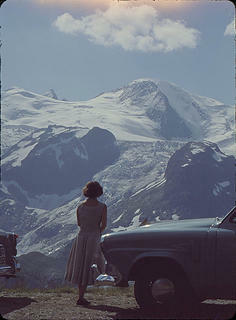 It looks like this was taken at Susten Pass, overlooking the Stein Glacier and the Gwächtenhorn. Really shows how the glacier has shrunk. Wow! I am really impressed that you recognized it or could find it! Thank you!